This article is about the machine. For the Leroy Anderson composition, see The Typewriter. A typewriter is a mechanical or electromechanical machine for writing characters similar to those produced by printer's movable type. Typically, a typewriter has an array of keys, and pressing one causes a different single character to be produced on the paper, by causing a ribbon with dried ink to be struck against the paper by a type element similar to the sorts used in movable type letterpress printing. Commonly, a separate type element (called a typebar) corresponds to each key, but the mechanism may also use a single type element (such as a typeball) with a different portion of it used for each possible character. At the end of the nineteenth century, the term typewriter was also applied to a person who used a typing machine. The first commercial typewriters were introduced in 1874, but did not become common in offices until after the mid-1880s. The typewriter quickly became an indispensable tool for practically all writing other than personal handwritten correspondence. It was widely used by professional writers, in offices, and for business correspondence in private homes. Typewriters were a standard fixture in most offices up to the 1980s. Thereafter, they began to be largely supplanted by the computer. Nevertheless, typewriters remain common in some parts of the world, are required for a few specific applications, and are popular in certain subcultures. In many Indian cities and towns, type writers are still used, especially in road side and legal offices due to a lack of continuous reliable electricity. The asdf QWERTY keyboard continues to be the standard used in computers too. Notable typewriter manufacturers included E. Remington and Sons, IBM, Godrej, Imperial Typewriter Company, Oliver Typewriter Company, Olivetti, Royal Typewriter Company, Smith Corona, Underwood Typewriter Company, Adler Typewriter Company and Olympia Werke [de]. Although many modern typewriters have one of several similar designs, their invention was incremental, developed by numerous inventors working independently or in competition with each other over a series of decades. As with the automobile, telephone, and telegraph, a number of people contributed insights and inventions that eventually resulted in ever more commercially successful instruments. Historians have estimated that some form of typewriter was invented 52 times as thinkers tried to come up with a workable design. In 1575, an Italian printmaker, Francesco Rampazetto, invented the scrittura tattile, a machine to impress letters in papers. In 1714, Henry Mill obtained a patent in Britain for a machine that, from the patent, appears to have been similar to a typewriter. The patent shows that this machine was actually created: "[he] hath by his great study and paines & expence invented and brought to perfection an artificial machine or method for impressing or transcribing of letters, one after another, as in writing, whereby all writing whatsoever may be engrossed in paper or parchment so neat and exact as not to be distinguished from print; that the said machine or method may be of great use in settlements and public records, the impression being deeper and more lasting than any other writing, and not to be erased or counterfeited without manifest discovery." In 1802, Italian Agostino Fantoni developed a particular typewriter to enable his blind sister to write. In 1808, Italian Pellegrino Turri invented a typewriter. He also invented carbon paper to provide the ink for his machine. In 1823, Italian Pietro Conti di Cilavegna invented a new model of typewriter, the tachigrafo, also known as tachitipo. In 1829, American William Austin Burt patented a machine called the "Typographer" which, in common with many other early machines, is listed as the "first typewriter". The London Science Museum describes it merely as "the first writing mechanism whose invention was documented", but even that claim may be excessive, since Turri's invention pre-dates it. Even in the hands of its inventor, this machine was slower than handwriting. Burt and his promoter John D. Sheldon never found a buyer for the patent, so the invention was never commercially produced. Because the typographer used a dial, rather than keys, to select each character, it was called an "index typewriter" rather than a "keyboard typewriter". Index typewriters of that era resemble the squeeze-style embosser from the 1960s more than they resemble the modern keyboard typewriter. By the mid-19th century, the increasing pace of business communication had created a need for mechanization of the writing process. Stenographers and telegraphers could take down information at rates up to 130 words per minute, whereas a writer with a pen was limited to a maximum of 30 words per minute (the 1853 speed record). From 1829 to 1870, many printing or typing machines were patented by inventors in Europe and America, but none went into commercial production. American Charles Thurber developed multiple patents, of which his first in 1843 was developed as an aid to the blind, such as the 1845 Chirographer. In 1855, the Italian Giuseppe Ravizza created a prototype typewriter called Cembalo scrivano o macchina da scrivere a tasti ("Scribe harpsichord, or machine for writing with keys"). It was an advanced machine that let the user see the writing as it was typed. In 1861, Father Francisco João de Azevedo, a Brazilian priest, made his own typewriter with basic materials and tools, such as wood and knives. In that same year the Brazilian emperor D. Pedro II, presented a gold medal to Father Azevedo for this invention. Many Brazilian people as well as the Brazilian federal government recognize Fr. Azevedo as the inventor of the typewriter, a claim that has been the subject of some controversy. In 1865, John Pratt, of Centre, Alabama (US), built a machine called the Pterotype which appeared in an 1867 Scientific American article and inspired other inventors. Between 1864 and 1867, Peter Mitterhofer [de], a carpenter from South Tyrol (then part of Austria) developed several models and a fully functioning prototype typewriter in 1867. In 1865, Rev. Rasmus Malling-Hansen of Denmark invented the Hansen Writing Ball, which went into commercial production in 1870 and was the first commercially sold typewriter. It was a success in Europe and was reported as being used in offices in London as late as 1909. Malling-Hansen used a solenoid escapement to return the carriage on some of his models which makes him a candidate for the title of inventor of the first "electric" typewriter. According to the book Hvem er skrivekuglens opfinder? (English: Who is the inventor of the Writing Ball? ), written by Malling-Hansen's daughter, Johanne Agerskov, in 1865, Malling-Hansen made a porcelain model of the keyboard of his writing ball and experimented with different placements of the letters to achieve the fastest writing speed. Malling-Hansen placed the letters on short pistons that went directly through the ball and down to the paper. This, together with the placement of the letters so that the fastest writing fingers struck the most frequently used letters, made the Hansen Writing Ball the first typewriter to produce text substantially faster than a person could write by hand. The Hansen Writing Ball was produced with only upper-case characters. The Writing Ball was used as a template for inventor Frank Haven Hall to create a derivative that would produce letter prints cheaper and faster. Malling-Hansen developed his typewriter further through the 1870s and 1880s and made many improvements, but the writing head remained the same. On the first model of the writing ball from 1870, the paper was attached to a cylinder inside a wooden box. In 1874, the cylinder was replaced by a carriage, moving beneath the writing head. Then, in 1875, the well-known "tall model" was patented, which was the first of the writing balls that worked without electricity. Malling-Hansen attended the world exhibitions in Vienna in 1873 and Paris in 1878 and he received the first-prize for his invention at both exhibitions. The first typewriter to be commercially successful was invented in 1878 by Americans Christopher Latham Sholes, Frank Haven Hall, Carlos Glidden and Samuel W. Soule in Milwaukee, Wisconsin, although Sholes soon disowned the machine and refused to use or even recommend it. It looked "like something like a cross between a piano and a kitchen table". The working prototype was made by the machinist Matthias Schwalbach. The patent (US 79,265) was sold for $12,000 to Densmore and Yost, who made an agreement with E. Remington and Sons (then famous as a manufacturer of sewing machines) to commercialize the machine as the Sholes and Glidden Type-Writer. This was the origin of the term typewriter. Remington began production of its first typewriter on March 1, 1873, in Ilion, New York. It had a QWERTY keyboard layout, which because of the machine's success, was slowly adopted by other typewriter manufacturers. As with most other early typewriters, because the typebars strike upwards, the typist could not see the characters as they were typed. 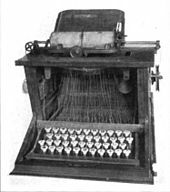 Coming into the market in the early 1880s, the index typewriter uses a pointer or stylus to choose a letter from an index. The pointer is mechanically linked so that the letter chosen could then be printed, most often by the activation of a lever. 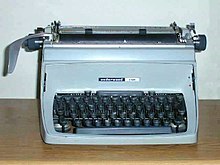 The index typewriter was briefly popular in niche markets. Although they were slower than keyboard type machines they were mechanically simpler and lighter, they were therefore marketed as being suitable for travellers, and because they could be produced more cheaply than keyboard machines, as budget machines for users who needed to produce small quantities of typed correspondence. The index typewriter's niche appeal however soon disappeared, as on the one hand new keyboard typewriters became lighter and more portable and on the other refurbished second hand machines began to become available. 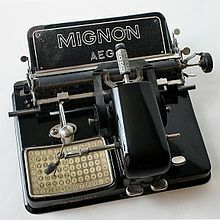 The last widely available western index machine was the Mignon typewriter produced by AEG which was produced until 1934. Considered one of the very best of the index typewriters, part of the Mignon's popularity was that it featured both interchangeable indexes and type, allowing the use of different fonts and character sets, something very few keyboard machines allowed and only at considerable added cost. Although pushed out of the market in most of the world by keyboard machines, successful Japanese and Chinese typewriters are of the index type albeit with a very much larger index and number of type elements. By about 1910, the "manual" or "mechanical" typewriter had reached a somewhat standardized design. There were minor variations from one manufacturer to another, but most typewriters followed the concept that each key was attached to a typebar that had the corresponding letter molded, in reverse, into its striking head. When a key was struck briskly and firmly, the typebar hit a ribbon (usually made of inked fabric), making a printed mark on the paper wrapped around a cylindrical platen. The platen was mounted on a carriage that moved left or right, automatically advancing the typing position horizontally after each character was typed. The paper, rolled around the typewriter's platen, was then advanced vertically by the carriage-return lever (at the far left, or on the far right for left handed typewriters) into position for each new line of text. A small bell was struck a few characters before the right hand margin was reached to warn the operator to complete the word and then use the carriage-return lever to shift the paper back to the beginning of the next line. In most of the early typewriters, the typebars struck upward against the paper, pressed against the bottom of the platen, so the typist could not see the text as it was typed. What was typed was not visible until a carriage return caused it to scroll into view. The difficulty with any other arrangement was ensuring the typebars fell back into place reliably when the key was released. This was eventually achieved with various ingenious mechanical designs and so-called "visible typewriters" which used frontstriking, in which the typebars struck forward against the front side of the platen, became standard. One of the first was the Daugherty Visible, introduced in 1893, which also introduced the four-bank keyboard that became standard, although the Underwood which came out two years later was the first major typewriter with these features. However, older "nonvisible" models continued in production to as late as 1915. A significant innovation was the shift key, introduced with the Remington No. 2 in 1878. This key physically "shifted" either the basket of typebars, in which case the typewriter is described as "basket shift", or the paper-holding carriage, in which case the typewriter is described as "carriage shift". Either mechanism caused a different portion of the typebar to come in contact with the ribbon/platen. The result is that each typebar could type two different characters, cutting the number of keys and typebars in half (and simplifying the internal mechanisms considerably). The obvious use for this was to allow letter keys to type both upper and lower case, but normally the number keys were also duplexed, allowing access to special symbols such as percent (%) and ampersand (&). Before the shift key, typewriters had to have a separate key and typebar for upper-case letters; in essence, the typewriter had two keyboards, one above the other. With the shift key, manufacturing costs (and therefore purchase price) were greatly reduced, and typist operation was simplified; both factors contributed greatly to mass adoption of the technology. Certain models, such as the Barlet, had a double shift so that each key performed three functions. These little three-row machines were portable and could be used by journalists. However, because the shift key required more force to push (its mechanism was moving a much larger mass than other keys), and was operated by the little finger (normally the weakest finger on the hand), it was difficult to hold the shift down for more than two or three consecutive strokes. The "shift lock" key (the precursor to the modern caps lock) allowed the shift operation to be maintained indefinitely. In English-speaking countries, ordinary typewriters printing fixed-width characters were standardized to print six horizontal lines per vertical inch, and had either of two variants of character width, called "pica" for ten characters per horizontal inch and "elite" for twelve. This differed from the use of these terms in printing, where "pica" is a linear unit (approximately ​1⁄6 of an inch) used for any measurement, the most common one being the height of a type face. Some typewriters were designed to print extra-large type (commonly double height, double width) for labelling purposes. Classification numbers on books in libraries could be done this way. Some ribbons were inked in black and red stripes, each being half the width and running the entire length of the ribbon. A lever on most machines allowed switching between colors, which was useful for bookkeeping entries where negative amounts were highlighted in red. The red color was also used on some selected characters in running text, for emphasis. When a typewriter had this facility, it could still be fitted with a solid black ribbon; the lever was then used to switch to fresh ribbon when the first stripe ran out of ink. Some typewriters also had a third position which stopped the ribbon being struck at all. This enabled the keys to hit the paper unobstructed, and was used for cutting stencils for stencil duplicators (aka mimeograph machines). In the early part of the 20th century, a typewriter was marketed under the name "Noiseless" and advertised as "silent". It was developed by Wellington Parker Kidder and the first model was marketed by the Noiseless Typewriter Company in 1917. An agreement with Remington in 1924 saw production transferred to Remington, and a further agreement in 1929 allowed Underwood to produce it as well. Noiseless portables sold well in the 1930s and 1940s, and noiseless standards continued to be manufactured until the 1960s. In a conventional typewriter the typebar reaches the end of its travel simply by striking the ribbon and paper. A "noiseless" typewriter has a complex lever mechanism that decelerates the typebar mechanically before pressing it against the ribbon and paper in an attempt to dampen the noise. It certainly reduced the high-frequency content of the sound, rendering it more of a "clunk" than a "clack" and arguably less intrusive, but such advertising claims as "A machine that can be operated a few feet away from your desk – And not be heard" were not true. Some electric typewriters were patented in the 19th century, but the first machine known to be produced in series is the Cahill of 1900. Another electric typewriter was produced by the Blickensderfer Manufacturing Company, of Stamford, Connecticut, in 1902. Like the manual Blickensderfer typewriters, it used a cylindrical typewheel rather than individual typebars. The machine was produced in several variants but apparently it was not a commercial success, for reasons that are unclear. The next step in the development of the electric typewriter came in 1910, when Charles and Howard Krum filed a patent for the first practical teletypewriter. The Krums' machine, named the Morkrum Printing Telegraph, used a typewheel rather than individual typebars. This machine was used for the first commercial teletypewriter system on Postal Telegraph Company lines between Boston and New York City in 1910. James Fields Smathers of Kansas City invented what is considered the first practical power-operated typewriter in 1914. In 1920, after returning from Army service, he produced a successful model and in 1923 turned it over to the Northeast Electric Company of Rochester for development. Northeast was interested in finding new markets for their electric motors and developed Smathers's design so that it could be marketed to typewriter manufacturers, and from 1925 Remington Electric typewriters were produced powered by Northeast's motors. After some 2,500 electric typewriters had been produced, Northeast asked Remington for a firm contract for the next batch. However, Remington was engaged in merger talks which would eventually result in the creation of Remington Rand and no executives were willing to commit to a firm order. Northeast instead decided to enter the typewriter business for itself, and in 1929 produced the first Electromatic Typewriter. In 1928, Delco, a division of General Motors, purchased Northeast Electric, and the typewriter business was spun off as Electromatic Typewriters, Inc. In 1933, Electromatic was acquired by IBM, which then spent 1 million USD on a redesign of the Electromatic Typewriter, launching the IBM Electric Typewriter Model 01 in 1935. By 1958 IBM was deriving 8% of its revenue from the sale of electric typewriters. In 1931, an electric typewriter was introduced by Varityper Corporation. It was called the Varityper, because a narrow cylinder-like wheel could be replaced to change the font. Electrical typewriter designs removed the direct mechanical connection between the keys and the element that struck the paper. Not to be confused with later electronic typewriters, electric typewriters contained only a single electrical component: the motor. Where the keystroke had previously moved a typebar directly, now it engaged mechanical linkages that directed mechanical power from the motor into the typebar. In 1941, IBM announced the Electromatic Model 04 electric typewriter, featuring the revolutionary concept of proportional spacing. By assigning varied rather than uniform spacing to different sized characters, the Type 4 recreated the appearance of a printed page, an effect that was further enhanced by including the 1937 innovation of carbon-film ribbons that produced clearer, sharper words on the page. The proportional spacing feature became a staple of the IBM Executive series typewriters. IBM and Remington Rand electric typewriters were the leading models until IBM introduced the IBM Selectric typewriter in 1961, which replaced the typebars with a spherical element (or typeball) slightly smaller than a golf ball, with reverse-image letters molded into its surface. The Selectric used a system of latches, metal tapes, and pulleys driven by an electric motor to rotate the ball into the correct position and then strike it against the ribbon and platen. The typeball moved laterally in front of the paper, instead of the previous designs using a platen-carrying carriage moving the paper across a stationary print position. Due to the physical similarity, the typeball was sometimes referred to as a "golfball". The typeball design had many advantages, especially the elimination of "jams" (when more than one key was struck at once and the typebars became entangled) and in the ability to change the typeball, allowing multiple fonts to be used in a single document. The IBM Selectric became a commercial success, dominating the office typewriter market for at least two decades. IBM also gained an advantage by marketing more heavily to schools than did Remington, with the idea that students who learned to type on a Selectric would later choose IBM typewriters over the competition in the workplace as businesses replaced their old manual models. By the 1970s, IBM had succeeded in establishing the Selectric as the de facto standard typewriter in mid- to high-end office environments, replacing the raucous "clack" of older typebar machines with the quieter sound of gyrating typeballs. Later models of IBM Executives and Selectrics replaced inked fabric ribbons with "carbon film" ribbons that had a dry black or colored powder on a clear plastic tape. These could be used only once, but later models used a cartridge that was simple to replace. A side effect of this technology was that the text typed on the machine could be easily read from the used ribbon, raising issues where the machines were used for preparing classified documents (ribbons had to be accounted for to ensure that typists did not carry them from the facility). A variation known as "Correcting Selectrics" introduced a correction feature, where a sticky tape in front of the carbon film ribbon could remove the black-powdered image of a typed character, eliminating the need for little bottles of white dab-on correction fluid and for hard erasers that could tear the paper. These machines also introduced selectable "pitch" so that the typewriter could be switched between pica type (10 characters per inch) and elite type (12 per inch), even within one document. Even so, all Selectrics were monospaced—each character and letterspace was allotted the same width on the page, from a capital "W" to a period. Although IBM had produced a successful typebar-based machine with five levels of proportional spacing, called the IBM Executive, proportional spacing was not provided with the Selectric typewriter or its successors the Selectric II and Selectric III. The only fully electromechanical Selectric Typewriter with fully proportional spacing and which used a Selectric type element was the expensive Selectric Composer, which was capable of right-margin justification and was considered a typesetting machine rather than a typewriter. In addition to its electronic successors, the Magnetic Tape Selectric Composer (MT/SC), the Mag Card Selectric Composer, and the Electronic Selectric Composer, IBM also made electronic typewriters with proportional spacing using the Selectric element that were considered typewriters or word processors instead of typesetting machines. The first of these was the relatively obscure Mag Card Executive, which used 88-character elements. Later, some of the same typestyles used for it were used on the 96-character elements used on the IBM Electronic Typewriter 50 and the later models 65 and 85. By 1970, as offset printing began to replace letterpress printing, the Composer would be adapted as the output unit for a typesetting system. The system included a computer-driven input station to capture the key strokes on magnetic tape and insert the operator's format commands, and a Composer unit to read the tape and produce the formatted text for photo reproduction. The IBM 2741 terminal was a popular example of a Selectric-based computer terminal, and similar mechanisms were employed as the console devices for many IBM System/360 computers. These mechanisms used "ruggedized" designs compared to those in standard office typewriters. A recording of the sound of typing on a Smith-Corona electric typewriter. Some of IBM's advances were later adopted in less expensive machines from competitors. For example, Smith-Corona electric typewriters introduced in 1973 switched to interchangeable Coronamatic (SCM-patented) ribbon cartridges, including fabric, film, erasing, and two-color versions. At about the same time, the advent of photocopying meant that carbon copies and erasers were less and less necessary; only the original need be typed, and photocopies made from it. 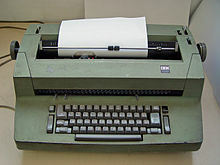 Towards the end of the commercial popularity of typewriters in the 1970s, a number of hybrid designs combining features of printers were introduced. These often incorporated keyboards from existing models of typewriters and printing mechanisms of dot-matrix printers. The generation of teleprinters with impact pin-based printing engines was not adequate for the demanding quality required for typed output, and alternative thermal transfer technologies used in thermal label printers had become technically feasible for typewriters. IBM produced a series of typewriters called Thermotronic with letter-quality output and correcting tape along with printers tagged Quietwriter. Brother extended the life of their typewriter product line with similar products. The development of these proprietary printing engines provided the vendors with exclusive markets in consumable ribbons and the ability to use standardized printing engines with varying degrees of electronic and software sophistication to develop product lines. Although these changes reduced prices—and greatly increased the convenience—of typewriters, the technological disruption posed by word processors left these improvements with only a short-term low-end market. To extend the life of these products, many examples were provided with communication ports to connect them to computers as printers. The final major development of the typewriter was the electronic typewriter. 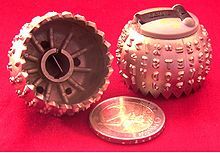 Most of these replaced the typeball with a plastic or metal daisy wheel mechanism (a disk with the letters molded on the outside edge of the "petals"). The daisy wheel concept first emerged in printers developed by Diablo Systems in the 1970s. In 1981, Xerox Corporation, who by then had bought Diablo Systems, introduced a line of electronic typewriters incorporating this technology (the Memorywriter product line). For a time, these products were quite successful as their daisy-wheel mechanism was much simpler and cheaper than either typebar or Selectric mechanisms, and their electronic memory and display allowed the user to easily see errors and correct them before they were actually printed. One problem with the plastic daisy wheel was that they were not always durable. To solve this problem, more durable metal daisy wheels were made available (but at a slightly higher price). These and similar electronic typewriters were in essence dedicated word processors with either single-line LCD displays or multi-line CRT displays, built-in line editors in ROM, a spelling and grammar checker, a few kilobytes of internal RAM and optional cartridge, magnetic card or diskette external memory-storage devices for storing text and even document formats. Text could be entered a line or paragraph at a time and edited using the display and built-in software tools before being committed to paper. Unlike the Selectrics and earlier models, these really were "electronic" and relied on integrated circuits and multiple electromechanical components. These typewriters were sometimes called display typewriters, dedicated word processors or word-processing typewriters, though the latter term was also frequently applied to less sophisticated machines that featured only a tiny, sometimes just single-row display. Sophisticated models were also called word processors, though today that term almost always denotes a type of software program. Manufacturers of such machines included Brother (Brother WP1 and WP500 etc., where WP stood for word processor), Canon (Canon Cat), Smith-Corona (PWP, i.e. Personal Word Processor line) and Philips/Magnavox (VideoWriter). The 1970s and early 1980s were a time of transition for typewriters and word processors. At one point in time, most small-business offices would be completely "old-style", while large corporations and government departments would already be "new-style"; other offices would have a mixture. The pace of change was so rapid that it was common for clerical staff to have to learn several new systems, one after the other, in just a few years. While such rapid change is commonplace today, and is taken for granted, this was not always so; in fact, typewriting technology changed very little in its first 80 or 90 years. Due to falling sales, IBM sold its typewriter division in 1991 to Lexmark, completely exiting from a market it once dominated. The increasing dominance of personal computers, desktop publishing, the introduction of low-cost, truly high-quality laser and inkjet printer technologies, and the pervasive use of web publishing, e-mail and other electronic communication techniques have largely replaced typewriters in the United States. Still, as of 2009[update], typewriters continued to be used by a number of government agencies and other institutions in the US, where they are primarily used to fill preprinted forms. According to a Boston typewriter repairman quoted by The Boston Globe, "Every maternity ward has a typewriter, as well as funeral homes". A fairly major typewriter user is the City of New York, which in 2008 purchased several thousand typewriters, mostly for use by the New York Police Department, at the total cost of $982,269. Another $99,570 was spent in 2009 for the maintenance of the existing typewriters. New York police officers would use the machines to type property and evidence vouchers on carbon paper forms. A rather specialized market for typewriters exists due to the regulations of many correctional systems in the US, where prisoners are prohibited from having computers or telecommunication equipment, but are allowed to own typewriters. The Swintec corporation (headquartered in Moonachie, New Jersey), which, as of 2011, still produced typewriters at its overseas factories (in Japan, Indonesia, and/or Malaysia), manufactures a variety of typewriters for use in prisons, made of clear plastic (to make it harder for prisoners to hide prohibited items inside it). As of 2011, the company had contracts with prisons in 43 US states. In April 2011, Godrej and Boyce, a Mumbai-based manufacturer of mechanical typewriters, closed its doors, leading to a flurry of erroneous news reports that the "world's last typewriter factory" had shut down. The reports were quickly debunked. In November 2012, Brother's UK factory manufactured what it claimed to be the last typewriter ever made in the UK; the typewriter was donated to the London Science Museum. Russian typewriters use Cyrillic, which has made the ongoing Azerbaijani reconversion from Cyrillic to Latin alphabet more difficult. In 1997, the government of Turkey offered to donate western typewriters to the Republic of Azerbaijan in exchange for more zealous and exclusive promotion of the Latin alphabet for the Azerbaijani language; this offer, however, was declined. In Latin America and Africa, mechanical typewriters are still common because they can be used without electrical power. In Latin America, the typewriters used are most often Brazilian models; Brazil continues to produce mechanical (Facit) and electronic (Olivetti) typewriters to the present day. The 21st century has seen a revival of interest in typewriters among certain subcultures, including makers, steampunks, hipsters, and street poets. According to the standards taught in secretarial schools in the mid-20th century, a business letter was supposed to have no mistakes and no visible corrections. Accuracy was prized as much as speed. Indeed, typing speeds, as scored in proficiency tests and typewriting speed competitions, included a deduction of ten words for every mistake. Corrections were, of course, necessary, and many methods were developed. In practice, several methods would often be combined. For example, if six extra copies of a letter were needed, the fluid-corrected original would be photocopied, but only for the two recipients getting "c.c. "s; the other four copies, the less-important file copies that stayed in various departments at the office, would be cheaper, hand-erased, less-distinct bond paper copies or even "flimsies" of different colors (tissue papers interleaved with black carbon paper) that were all typed as a "carbon pack" at the same time as the original. In informal applications such as personal letters where low priority was placed on the appearance of the document, or conversely in highly formal applications in which it was important that any corrections be obvious, the backspace key could be used to back up over the error and then overstrike it with hyphens, slashes, Xs, or the like. The traditional erasing method involved the use of a special typewriter eraser made of hard rubber that contained an abrasive material. Some were thin, flat disks, pink or gray, approximately 2 inches (51 mm) in diameter by 1⁄8 inch (3.2 mm) thick, with a brush attached from the center, while others looked like pink pencils, with a sharpenable eraser at the "lead" end and a stiff nylon brush at the other end. Either way, these tools made possible erasure of individual typed letters. Business letters were typed on heavyweight, high-rag-content bond paper, not merely to provide a luxurious appearance, but also to stand up to erasure. Typewriter eraser brushes were necessary for clearing eraser crumbs and paper dust, and using the brush properly was an important element of typewriting skill; if erasure detritus fell into the typewriter, a small buildup could cause the typebars to jam in their narrow supporting grooves. Erasing a set of carbon copies was particularly difficult, and called for the use of a device called an eraser shield (a thin stainless-steel rectangle about 2 by 3 inches (51 by 76 mm) with several tiny holes in it) to prevent the pressure of erasing on the upper copies from producing carbon smudges on the lower copies. To correct copies, typists had to go from carbon copy to carbon copy, trying not to get their fingers dirty as they leafed through the carbon papers, and moving and repositioning the eraser shield and eraser for each copy. In the 1950s and 1960s, correction fluid made its appearance, under brand names such as Liquid Paper, Wite-Out and Tipp-Ex; it was invented by Bette Nesmith Graham. Correction fluid was a kind of opaque, white, fast-drying paint that produced a fresh white surface onto which, when dry, a correction could be retyped. However, when held to the light, the covered-up characters were visible, as was the patch of dry correction fluid (which was never perfectly flat, and frequently not a perfect match for the color, texture, and luster of the surrounding paper). The standard trick for solving this problem was photocopying the corrected page, but this was possible only with high quality photocopiers. A different fluid was available for correcting stencils. It sealed up the stencil ready for retyping but did not attempt to color match. Dry correction products (such as correction paper) under brand names such as "Ko-Rec-Type" were introduced in the 1970s and functioned like white carbon paper. A strip of the product was placed over the letters needing correction, and the incorrect letters were retyped, causing the black character to be overstruck with a white overcoat. Similar material was soon incorporated in carbon-film electric typewriter ribbons; like the traditional two-color black-and-red inked ribbon common on manual typewriters, a black and white correcting ribbon became commonplace on electric typewriters. But the black or white coating could be partly rubbed off with handling, so such corrections were generally not acceptable in legal documents. The pinnacle of this kind of technology was the IBM Electronic Typewriter series. These machines, and similar products from other manufacturers, used a separate correction ribbon and a character memory. With a single keystroke, the typewriter was capable of automatically backspacing and then overstriking the previous characters with minimal marring of the paper. White cover-up ribbons were used with fabric ink ribbons, or an alternate premium design featured plastic lift-off correction ribbons which were used with carbon film typing ribbons. This latter technology actually lifted the carbon film forming a typed letter, leaving nothing more than a flattened depression in the surface of the paper, with the advantage that no color matching of the paper was needed. The "QWERTY" layout of typewriter keys became a de facto standard and continues to be used long after the reasons for its adoption (including reduction of key/lever entanglements) have ceased to apply. 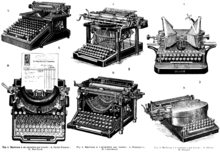 The 1874 Sholes & Glidden typewriters established the "QWERTY" layout for the letter keys. During the period in which Sholes and his colleagues were experimenting with this invention, other keyboard arrangements were apparently tried, but these are poorly documented. The QWERTY layout of keys has become the de facto standard for English-language typewriter and computer keyboards. Other languages written in the Latin alphabet sometimes use variants of the QWERTY layouts, such as the French AZERTY, the Italian QZERTY and the German QWERTZ layouts. The QWERTY layout is not the most efficient layout possible for the English language, since it requires a touch-typist to move his or her fingers between rows to type the most common letters. Although the QWERTY keyboard was the most commonly used layout in typewriters, a better, less strenuous keyboard was being searched for throughout the late 1900s. One popular but unverified explanation for the QWERTY arrangement is that it was designed to reduce the likelihood of internal clashing of typebars by placing commonly used combinations of letters farther from each other inside the machine. Another story is that the QWERTY layout allowed early typewriter salesmen to impress their customers by being able to easily type out the example word "typewriter" without having learned the full keyboard layout, because "typewriter" can be spelled purely on the top row of the keyboard. However, there is no evidence to support these claims. Typewriters were also made for East Asian languages with thousands of characters, such as Chinese or Japanese. They were not easy to operate, but professional typists used them for a long time until the development of electronic word processors and laser printers in the 1980s. On modern keyboards, the exclamation point is the shifted character on the 1 key, a direct result of the historical fact that these were the last characters to become "standard" on keyboards. Holding the spacebar pressed down usually suspended the carriage advance mechanism (a so-called "dead key" feature), allowing one to superimpose multiple keystrikes on a single location. 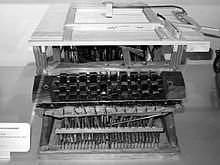 The ¢ symbol (meaning cents) was located above the number 6 on electric typewriters, while ASCII computer keyboards have ^ instead. A number of typographical conventions originate from the widespread use of the typewriter, based on the characteristics and limitations of the typewriter itself. For example, the QWERTY keyboard typewriter did not include keys for the en dash and the em dash. To overcome this limitation, users typically typed more than one adjacent hyphen to approximate these symbols. This typewriter convention is still sometimes used today, even though modern computer word processing applications can input the correct en and em dashes for each font type. Double hyphens are also standard in Western comics lettering despite historically being done by hand. Other examples of typewriter practices that are sometimes still used in desktop publishing systems include inserting a double space at the end of a sentence, and the use of straight quotes (or "dumb quotes") as quotation marks and prime marks. The practice of underlining text in place of italics and the use of all capitals to provide emphasis are additional examples of typographical conventions that derived from the limitations of the typewriter keyboard that still carry on today. Many older typewriters did not include a separate key for the numeral 1 or the exclamation point, and some even older ones also lacked the numeral zero. Typists who trained on these machines learned the habit of using the lowercase letter l ("ell") for the digit 1, and the uppercase O for the zero. A cents symbol (¢) was created by combining (over-striking) a lower case "c" with a slash character (typing "c", then backspace, then "/"). Similarly, the exclamation point was created by combining an apostrophe and a period. These characters were omitted to simplify design and reduce manufacturing and maintenance costs; they were chosen specifically because they were "redundant" and could be recreated using other keys. backspace (BS) – a keystroke that moved the cursor backwards one position (on a physical platen, this is the exact opposite of the space key), for the purpose of overtyping a character. This could be for combining characters (e.g. an apostrophe, backspace, and period make an exclamation point—a character missing on some early typewriters), or for correction such as with the correcting tape that developed later. carriage return (CR) – return to the first column of text and, in some systems, switch to the next line. cursor – a marker used to indicate where the next character will be printed. The cursor, however, was originally a term to describe the clear slider on a slide rule. cut and paste – taking text, a numerical table, or an image and pasting it into a document. The term originated when such compound documents were created using manual paste up techniques for typographic page layout. Actual brushes and paste were later replaced by hot-wax machines equipped with cylinders that applied melted adhesive wax to developed prints of "typeset" copy. This copy was then cut out with knives and rulers, and slid into position on layout sheets on slanting layout tables. After the "copy" had been correctly positioned and squared up using a T-square and set square, it was pressed down with a brayer, or roller. The whole point of the exercise was to create so-called "camera-ready copy" which existed only to be photographed and then printed, usually by offset lithography. dead key – a key that, when typed, does not advance the typing position, thus allowing another character to be overstruck on top of the original character. This was typically used to combine diacritical marks with letters they modified (e.g. è can be generated by first pressing ` and then e). The dead key feature was often implemented mechanically by having the typist press and hold the space bar while typing the characters to be superimposed. line feed (LF), also called "newline" – moving the cursor to the next on-screen line of text in a word processor document. shift – a modifier key used to type capital letters and other alternate "upper case" characters; when pressed and held down, would shift a typewriter's mechanism to allow a different typebar impression (such as 'D' instead of 'd') to press into the ribbon and print on a page. The concept of a shift key or modifier key was later extended to Ctrl, Alt, and Super ("Windows" or "Apple") keys on modern computer keyboards. The generalized concept of a shift key reached its apex in the MIT space-cadet keyboard. tab (HT), shortened from "horizontal tab" or "tabulator stop" – caused the print position to advance horizontally to the next pre-set "tab stop". This was used for typing lists and tables with vertical columns of numbers or words. The related term "vertical tab" (VT) never came into widespread use. tty, short for teletypewriter – used in Unix-like operating systems to designate a given "terminal". In the above listing, the two-letter codes in parentheses are abbreviations for the ASCII characters derived from typewriter usage. When Remington started marketing typewriters, the company assumed the machine would not be used for composing but for transcribing dictation, and that the person typing would be a woman. The 1800s Sholes and Glidden typewriter had floral ornamentation on the case. During World War I and II, increasing numbers of women were entering the workforce. In the United States, women often started in the professional workplace as typists. Questions about morals made a salacious businessman making sexual advances to a female typist into a cliché of office life, appearing in vaudeville and movies. Being a typist was considered the right choice for a "good girl" meaning women who present themselves as being chaste and having good conduct. According to the 1900 census, 94.9% of stenographers and typists were unmarried women. The "Tijuana bibles" – adult comic books produced in Mexico for the American market, starting in the 1930s – often featured women typists. In one panel, a businessman in a three-piece suit, ogling his secretary's thigh, says, "Miss Higby, are you ready for—ahem!—er—dictation?" Henry James dictated to a typist. Mark Twain claimed in his autobiography that he was the first important writer to present a publisher with a typewritten manuscript, for The Adventures of Tom Sawyer (1876). Research showed that Twain's memory was incorrect and that the first book submitted in typed form was Life on the Mississippi (1883, also by Twain). William S. Burroughs wrote in some of his novels—and possibly believed—that "a machine he called the 'Soft Typewriter' was writing our lives, and our books, into existence", according to a book review in The New Yorker. In the film adaptation of his novel Naked Lunch, his typewriter is a living, insect-like entity (voiced by North American actor Peter Boretski) and actually dictates the book to him. Writer Zack Helm and director Mark Forster explored the potential mechanics of the "Soft Typewriter" philosophy in the movie Stranger than Fiction, in which the very act of typing up her handwritten notes gives a fiction writer the power to kill or otherwise manipulate her main character in real life. Ernest Hemingway used to write his books standing up in front of a Royal typewriter suitably placed on a tall bookshelf. 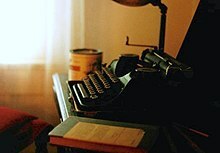 This typewriter, still on its bookshelf, is kept in Finca Vigía, Hemingway's Havana house (now a museum), where he lived until 1960, the year before his death. J. R. R. Tolkien was likewise accustomed to typing from awkward positions: "balancing his typewriter on his attic bed, because there was no room on his desk". In his Foreword to The Lord of the Rings, Tolkien stated that "the whole story ... had to be typed, and re-typed: by me; the cost of professional typing by the ten-fingered was beyond my means." Jack Kerouac, a fast typist at 100 words per minute, typed On the Road on a roll of paper so he would not be interrupted by having to change the paper. Within two weeks of starting to write On the Road, Kerouac had one single-spaced paragraph, 120 feet long. Some scholars say the scroll was shelf paper; others contend it was a Thermo-fax roll; another theory is that the roll consisted of sheets of architect’s paper taped together. His rapid work earned the famous rebuke from Truman Capote, "That's not writing, it's typing." Another fast typist of the Beat Generation was Richard Brautigan, who said that he thought out the plots of his books in detail beforehand, then typed them out at speeds approaching 90 to 100 words a minute. Tom Robbins waxed philosophical about the Remington SL3, a typewriter that he bought to write Still Life with Woodpecker. He eventually did away with it because it is too complicated and inhuman for the writing of poetry. Don Marquis purposely used the limitations of a typewriter (or more precisely, a particular typist) in his archy and mehitabel series of newspaper columns, which were later compiled into a series of books. According to his literary conceit, a cockroach named "Archy" was a reincarnated free-verse poet, who would type articles overnight by jumping onto the keys of a manual typewriter. The writings were typed completely in lower case, because of the cockroach's inability to generate the heavy force needed to operate the shift key. The lone exception is the poem "CAPITALS AT LAST" from archys life of mehitabel, written in 1933. Author Ray Bradbury used a typewriter for rent at the library to write his work known as Fahrenheit 451, which was published in 1953. Andy Rooney and William F. Buckley Jr. (1982) were among many writers who were very reluctant to switch from typewriters to computers. David McCullough bought a second-hand Royal typewriter in 1965 and has used it to compose every book he has published. Hunter S. Thompson kept a typewriter in his kitchen and is believed to have written his "Hey, Rube!" column for ESPN.com on a typewriter. He used a typewriter until his suicide in 2005. Theodore Kaczynski, the Unabomber, wrote his manifesto as well as his letters on a manual typewriter. David Sedaris used a typewriter to write his essay collections through Me Talk Pretty One Day at least. William Gibson used a Hermes 2000 model manual typewriter to write Neuromancer and half of Count Zero before a mechanical failure and lack of replacement parts forced him to upgrade to an Apple IIc computer. Harlan Ellison has used typewriters for his entire career, and when he was no longer able to have them repaired, learned to do it himself; he has repeatedly stated his belief that computers are bad for writing, maintaining, "Art is not supposed to be easier!" Author Cormac McCarthy continues to write his novels on an Olivetti Lettera 32 typewriter to the present day. In 2009, the Lettera he obtained from a pawn shop in 1963, on which nearly all his novels and screenplays have been written, was auctioned for charity at Christie's for US$254,500; McCarthy obtained an identical replacement for $20 to continue writing on. Will Self explains why he uses a manual typewriter: "I think the computer user does their thinking on the screen, and the non-computer user is compelled, because he or she has to retype a whole text, to do a lot more thinking in the head." The composer Pablo Sorozábal includes in a scene of his zarzuela La eterna canción (1945) a typewriter, accompanied by an orchestra and vocal soloists: the scene is in a police station, where a policeman is deposing witnesses, and is singing while he types the report. The composer Leroy Anderson wrote The Typewriter (1950) for orchestra and typewriter, and it has since been used as the theme for numerous radio programs. The solo instrument is a real typewriter played by a percussionist. The piece was later made famous by comedian Jerry Lewis as part of his regular routine both on screen and stage, most notably in the 1963 film Who's Minding the Store?. Frank Loesser's music for the stage (1961) and screen (1967) musical How to Succeed in Business Without Really Trying employs the typewriter as a percussion instrument in the song "A Secretary is Not a Toy". The clacking of typewriter keys can be heard at the beginning of Dolly Parton's song "9 to 5". Parton has said in interviews that when writing the song, to mimic the typing keys sound, she would run her acrylic fingernails back and forth against each other. The song "Embassy Lament" from the 1986 musical Chess mimics the sound of typing in the bridge. A typewriter provides the percussive backing for Stereo Total's "Dactylo Rock", the first song from their 1995 debut album Oh Ah!. A suite of songs entitled "Green Typewriters" is on The Olivia Tremor Control's album Dusk At Cubist Castle (1996), and the sounds of typewriters can be heard in a few of the sections. Guster's 1999 song "Barrel of a Gun" features a typewriter as percussion. American musician Beck's 2005 music video for "Black Tambourine" features typewriter characters to animate Beck's moving and playing guitar. 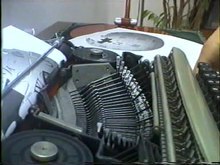 The title track of Heernt's 2006 album Locked in a Basement prominently features the typewriter as a percussion instrument. The Boston Typewriter Orchestra (BTO) has performed at numerous art festivals, clubs, and parties since 2004. The group consists of a half-dozen performers who use typewriters as percussive musical instruments, under the slogan, "The revolution will be typewritten". South Korean improviser Ryu Hankil frequently performs typewriters, most prominently in his 2009 album Becoming Typewriter. Lead singer and songwriter Eddie Vedder of Pearl Jam types many of the band's lyrics on vintage typewriters. In the film The History of the Typewriter recited by Michael Winslow, voice sound effect performer Michael Winslow recreates the sounds of 32 typewriters from history. The word "typewriter" is often cited as the longest English word that can be typed using only one row of keys of a QWERTY keyboard. This is untrue, since "rupturewort" (a kind of flowering plant) has 11 letters, while "typewriter" has only 10. Taber's Cyclopedic Medical Dictionary defines "uropyoureter" (12 letters). A sentence which uses every letter of the alphabet (a pangram), "A quick brown fox jumps over the lazy dog" can be used to check typewriters quickly. The early Resident Evil video games use a typewriter as the save feature, and use one ink ribbon per save. The opening title sequence of Murder, She Wrote prominently features Jessica Fletcher touch-typing a manuscript with a 1940s Royal KMM Manual Typewriter. Although in one episode Fletcher rejects a character's offer to sell her a computer to replace the old Royal (which he calls a "dinosaur"), towards the series' end, she too begins using a computer and word-processing typewriter. In Rome the Altare della Patria, the national monument to King Victor Emmanuel II, used to be nicknamed "the typewriter" (la macchina per scrivere in Italian) because of its strange shape and popular dislike toward it. The 2012 French comedy movie Populaire, starring Romain Duris and Déborah François, centers around a young secretary in the 1950s striving to win typewriting speed competitions. Typewritten documents may be examined by forensic document examiners. This is done primarily to determine 1) the make and/or model of the typewriter used to produce a document, or 2) whether or not a particular suspect typewriter might have been used to produce a document. In some situations, an ink or correction ribbon may also be examined. The determination of a make and/or model of typewriter is a 'classification' problem and several systems have been developed for this purpose. These include the original Haas Typewriter Atlases (Pica version) and (Non-Pica version) and the TYPE system developed by Dr. Philip Bouffard, the Royal Canadian Mounted Police's Termatrex Typewriter classification system, and Interpol's typewriter classification system, among others. Because of the tolerances of the mechanical parts, slight variation in the alignment of the letters and their uneven wear, each typewriter has an individual "signature" or "fingerprint", which may permit a typewritten document to be traced back to the typewriter on which it was produced. For devices utilizing replaceable components, such as a typeball element, any association may be restricted to a specific element, rather than to the typewriter as a whole. The earliest reference in fictional literature to the potential identification of a typewriter as having produced a document was by Sir Arthur Conan Doyle, who wrote the Sherlock Holmes short story "A Case of Identity" in 1891. In non-fiction, the first document examiner to describe how a typewriter might be identified was William E. Hagan who wrote, in 1894, "All typewriter machines, even when using the same kind of type, become more or less peculiar by use as to the work done by them". Other early discussions of the topic were provided by A. S. Osborn in his 1908 treatise, Typewriting as Evidence, and again in his 1929 textbook, Questioned Documents. A modern description of the examination procedure is laid out in ASTM Standard E2494-08 (Standard Guide for Examination of Typewritten Items). Typewriter examination was used in the Leopold and Loeb and Alger Hiss cases. In the Eastern Bloc, typewriters (together with printing presses, copy machines, and later computer printers) were a controlled technology, with secret police in charge of maintaining files of the typewriters and their owners. In the Soviet Union, the First Department of each organization sent data on organization's typewriters to the KGB. This posed a significant risk for dissidents and samizdat authors. In Romania, according to State Council Decree No. 98 of March 28, 1983, owning a typewriter, both by businesses or by private persons, was subject to an approval given by the local police authorities. People previously convicted of any crime or those who because of their behaviour were considered to be "a danger to public order or to the security of the state" were refused approval. In addition, once a year, typewriter owners had to take the typewriter to the local police station, where they would be asked to type down a sample of all the typewriter's characters. It was also forbidden to borrow, lend, or repair typewriters other than at the places that had been authorized by the police. The ribbon can be read, although only if it has not been typed over more than once. This is not as easy as reading text from a page as the ribbon does not include spaces, but can be done, giving every typewriter a "memory". ^ "typewriter (2)". Oxford English Dictionary. Vol 18 (2nd ed.). Oxford University Press. 1989. p. 789. ^ James W. Cortada (2015). Before the Computer: IBM, NCR, Burroughs, and Remington Rand and the Industry They Created, 1865–1956. Princeton University Press. p. 38. ISBN 978-1-4008-7276-3. Archived from the original on 2018-06-26. ^ "Typewriters, Writing a Social History of Urban India". The Wire. Retrieved 18 March 2019. ^ Choudhury, Chirodeep; Bhatia, Sidharth (15 December 2016). With Great Truth & Regard: A Story of the Typewriter in India. Roli Books. ^ "The archives times - March - April 2013 - Lost and found, a 1984 photo revives those times" (PDF). Godrej archives. Retrieved 18 March 2019. ^ "From behind the scenes - Godrej Prima and the Stenographers handbook" (PDF). www.archives.godrej.com. Godrej archives. Retrieved 18 March 2019. ^ Acocella, Joan (April 9, 2007). "The Typing Life: How writers used to write". The New Yorker. Archived from the original on December 3, 2013. ^ "Scrittura | Museo dinamico della tecnologia Adriano Olivetti". museocasertaolivetti.altervista.org (in Italian). https://translate.google.pl/translate?hl=en&sl=it&u=http://museocasertaolivetti.altervista.org/scrittura/&prev=search. Archived from the original on 2017-06-21. Retrieved 2017-07-21. ^ "Henry Mill Patents". Todayinsci.com. Archived from the original on 2012-11-28. Retrieved 2012-03-30. ^ "History of Computers and Computing, Birth of the modern computer, The bases of digital computers, typewriter and computer keyboard". history-computer.com. Archived from the original on 2016-09-05. Retrieved 2016-09-19. ^ William Austin Burt's Typographer. Science Museum. 1829. ^ Utterback, James M. Utterback (1996). Mastering The Dynamics Of Innovation, 2nd Ed. Harvard Business Press. ISBN 978-0875847405. ^ "Thurber's Chirographer - Scientific American". todayinsci.com. Archived from the original on 2015-03-27. Retrieved 2017-01-20. ^ Adler, Michael (1997). Antique typewriters: from Creed to QWERTY. Atglen, Pa.: Schiffer Pub. ISBN 978-0-7643-0132-2. ^ "Type Writing Machine". Scientific American. New. 17 (1). New York. 1867-07-06. p. 3. Retrieved 2009-01-14. ^ Hearst Magazines (May 1929). Popular Mechanics. Hearst Magazines. p. 751. ^ Mares, G. C. (1909). The History of the Typewriter. London. p. 230. ^ "Early Office Museum". Archived from the original on 2 January 2014. Retrieved 1 December 2013. ^ Larson, Erik (2004). The Devil in the White City: A Saga of Magic and Murder at the Fair that Changed America. Knopf Doubleday Publishing Group. p. 291. ISBN 978-1-4000-7631-4. Archived from the original on 2018-06-26. ^ Hendrickson, Walter B. (1956). "The Three Lives of Frank H. Hall" (PDF). Journal of the Illinois State Historical Society. University of Illinois Press. 49 (3). Archived from the original (PDF) on 2010-08-06. ^ Anonymous (24 April 2011). "Hall Braille Writer". American Printing House for the Blind, Inc. Archived from the original on 27 April 2012. Retrieved 29 February 2012. ^ Otto Burghagen (1898). Die Schreibmaschine. Illustrierte Beschreibung aller gangbaren Schreibmaschinen nebst gründlicher Anleitung zum Arbeiten auf sämtlichen Systemen. ^ Dieter Eberwein. Nietzsches Schreibkugel. Ein Blick auf Nietzsches Schreibmaschinenzeit durch die Restauration der Schreibkugel. Eberwein-Typoskriptverlag. Schauenburg 2005. ^ Johanne Agerskov (1925). Hvem er Skrivekuglens Opfinder?. ^ Jocher, Katharine; Bliven, Bruce (1954). "Reviewed work: The Typewriter and the Men Who Made It., Richard N. Current; the Wonderful Writing Machine., Bruce Bliven, Jr". Social Forces. 33 (2): 197–198. doi:10.2307/2573562. JSTOR 2573562. ^ a b c d e "Antique Index Typewriters". Early Office Museum. Archived from the original on 2 July 2016. Retrieved 13 March 2017. ^ a b c "The Mignon 2". The Virtual Typewriter Museum. Archived from the original on 3 October 2016. Retrieved 13 March 2017. ^ "The Remington Type-Writing Machine". Nature. 14 (14.342): 43–44. 1876. Bibcode:1876Natur..14...43.. doi:10.1038/014043a0. ^ "How to prepare a mimeograph stencil by using a typewriter". LinguaLinks Library. SIL International. Archived from the original on 2012-10-16. Retrieved 2011-05-10. ^ "Bert Kerschbaumer, "The Cahill Electrical Typewriters," ETCetera No. 100 (December 2012)" (PDF). Archived (PDF) from the original on 2016-07-30. ^ "P. Robert Aubert, "The Last Service Call," ETCetera No. 33(December 1995)" (PDF). Archived (PDF) from the original on 2016-07-30. ^ "U.S. Patent 1,286,351 filed in May, 1910, and issued in December, 1918". Archived from the original on 2016-12-25. Retrieved 2011-09-16. ^ Colin Hempstead, William E. Worthington (2005). Encyclopedia of 20th Century Technology. Routledge. p. 605. ISBN 978-1-57958-464-1. ^ "IBM Electric Typewriter Model 01". 03.ibm.com. Archived from the original on 2013-05-26. Retrieved 2013-09-12. ^ "Changing the Type of Typewriter Made Easy". Popular Mechanics. Hearst Magazines: 83. July 1931. Archived from the original on 2018-06-26. ^ "IBM Typewriter Milestones". IBM Archives. Archived from the original on 2017-06-27. ^ Ellen, David (2005). Scientific Examination of Documents. CRC Press. pp. 106–107. ISBN 978-0-8493-3925-7. ^ Wershler-Henry, Darren (2005). The Iron Whim: A Fragmented History of Typewriting. Ithica and London: Cornell University Press. p. 254. ISBN 978-0-8014-4586-6. ^ "Smith-Corona". Mindmachine.co.uk. Archived from the original on 2013-05-28. Retrieved 2013-09-12. ^ Keene, Cindy Atoji (2009-02-01). "Typewriters ring on in the fringes". The Boston Globe. Archived from the original on 2013-08-26. ^ "The death of the typewriter? Don't write it off yet". Radio Netherlands Worldwide. 2011-04-27. Archived from the original on 2011-05-03. Retrieved 2012-03-30. ^ "Texas inmates have clear choice in typewriters". Fixed-mobile-convergence.tmcnet.com. 2011-06-15. Archived from the original on 2012-04-26. Retrieved 2012-03-30. ^ CBC News (April 26, 2011). "World's last typewriter plant stops production". Archived from the original on April 29, 2011. Retrieved April 27, 2011. A previous version of this story did not clearly state that Godrej & Boyce appears to be the world's last maker of mechanical typewriters, which operate solely on human power. Numerous other manufacturers continue to make several types of electric typewriters. ^ "Wite Out? World's 'last typewriter factory' apparently isn't". Content.usatoday.com. 2011-04-26. Archived from the original on 2012-07-07. Retrieved 2012-03-30. ^ Romenesko, Jim (2011-04-26). "Reports of typewriter's death are premature". Poynter.org. Archived from the original on 2011-09-04. Retrieved 2012-03-30. ^ Memmott, Mark (2011-04-26). "Has The Last Typewriter Factory Closed? Not Really". Npr.org. Archived from the original on 2012-03-13. Retrieved 2012-03-30. ^ Rohrlich, Justin (2011-04-25). "Contrary to Reports, Typewriter Industry "Far From Dead"". Archived from the original on 2016-02-24. ^ "UK's 'last typewriter' produced". BBC. 2012-11-20. Archived from the original on 2013-12-19. Retrieved 2013-09-12. ^ "Ainda se fabricam máquinas de escrever? (Are typewriters still manufactured?)". Mundoestranho.abril.com.br. Archived from the original on 2012-04-25. Retrieved 2012-03-30. ^ "How to correct a mimeograph stencil". LinguaLinks Library. SIL International. Archived from the original on 2012-10-16. Retrieved 2011-05-10. ^ Liebowitz, S. J.; Stephen E. Margolis (1990). "The Fable of the Keys". Journal of Law & Economics. The University of Chicago. XXXIII (April 1990): 1. doi:10.1086/467198. Archived from the original on 2008-07-03. Retrieved 2008-06-18. This article examines the history, economics, and ergonomics of the typewriter keyboard. We show that David's version of the history of the market's rejection of Dvorak does not report the true history, and we present evidence that the continued use of Qwerty is efficient given the current understanding of keyboard design. ^ David, P. A. (1986). "Understanding the Economics of QWERTY: the Necessity of History". In Parker, William N., Economic History and the Modern Economist. Basil Blackwell, New York and Oxford. ^ "Consider QWERTY". Archived from the original on May 15, 2008. Retrieved 2008-06-18. QWERTY's effect, by reducing those annoying clashes, was to speed up typing rather than slow it down. ^ "Instructions for Using the Blickensderfer Typewriter". Archived from the original on 2014-02-21. Retrieved 2014-01-03. ^ Upper and Lower Case Magazine. "U&lc Online Issue 41.1.1: Top Ten Type Crimes". Retrieved 23 March 2010. ^ Williams, Robin (2003). The Mac is not a typewriter: A style manual for creating professional-level type on your Macintosh (2nd ed.). Berkeley, California: Peachpit Press. ISBN 978-0-201-78263-9. ^ Felici, James (2003). The Complete Manual of Typography: A Guide to Setting Perfect Type. Berkeley, California: Peachpit Press. p. 80. ISBN 978-0-321-12730-3. ^ Rosendorf, Theodore (2009). The Typographic Desk Reference (1st ed.). New Castle, Delaware. ISBN 978-1-58456-231-3. ; Upper and Lower Case Magazine. "U&lc Online Issue 41.1.1: Top Ten Type Crimes". Retrieved 23 March 2010. ; Strizver, Ilene (2010). Type Rules: The Designer's Guide to Professional Typography (3rd ed.). New Jersey: John Wiley & Sons. p. 199. ISBN 978-0-470-54251-4. . Strizver states that "When available, true primes should be used for measurements, but typewriter quotes (not smart quotes) have become the accepted practice in digital typography." ^ Regents of the University of Minnesota (18 July 2007). "University of Minnesota Style Manual". University of Minnesota. Regents of the University of Minnesota. Archived from the original on January 17, 2009. Retrieved 12 May 2010. This topic is discussed under "Creating Professional-looking Text. "; Williams 2003. pps. 31, 33. Another example of the limitation of the typewriter in regard to underlining, was the necessity to underline the titles of books and stand-alone works in Bibliographies—works that would otherwise have been italicized, if that capability existed on the typewriter. ^ Truss, Lynn (2004). Eats, Shoot & Leaves: The Zero Tolerance Approach to Punctuation. New York: Gotham Books. p. 135. ISBN 978-1-59240-087-4. ^ "1876 Sholes, Gidden, Soule invention". Archived from the original on 14 December 2012. Retrieved 29 December 2012. ^ Boyer, Kate, and Kim England. "Gender, Work and Technology in the Information Workplace: From Typewriters to ATMs." Social & Cultural Geography 9.3 (2008): 241–56. Web. ^ Waller, Robert A. "WOMEN AND THE TYPEWRITER DURING THE FIRST FIFTY YEARS, 1873–1923". Studies in Popular Culture 9.1 (1986): 39–50. Web. ^ "The First Typewriter". Rehr, Darryl. Archived from the original on 2009-02-01. Retrieved 2009-02-16. ^ Foster, Edward H., Richard Brautigan, Twayne 1983. ^ "Blog archive". Archived from the original on 2007-10-21. ^ "Harlan Ellison Webderland: Interview". Harlanellison.com. Archived from the original on 2012-03-08. Retrieved 2012-03-30. ^ Kennedy, Randy (2009-12-04). "Cormac McCarthy's Typewriter Brings $254,500 at Auction - ArtsBeat Blog - NYTimes.com". Artsbeat.blogs.nytimes.com. Archived from the original on 2011-05-28. Retrieved 2010-01-11. ^ Patricia Cohen (November 30, 2009). "No Country for Old Typewriters: A Well-Used One Heads to Auction". New York Times. Archived from the original on September 4, 2014. ^ "Why typewriters beat computers". BBC News. 2008-05-30. Archived from the original on 2017-08-04. ^ Hurley, Sean. "Boston Orchestra Makes Typewriters Sing". NPR Music. National Public Radio. Archived from the original on 2012-03-08. Retrieved 2012-03-16. ^ "The Boston Typewriter Orchestra". Wordpress. Archived from the original on 2012-04-04. Retrieved 2012-03-16. ^ "Becoming Typewriter : Ryu Hankil : Free Download & Streaming : Internet Archive". 2001-03-10. Retrieved 2013-09-12. ^ "Populaire Bande Annonce Officielle". YouTube. Archived from the original on 2013-07-24. Retrieved 2013-09-12. ^ Haas, Josef. (1972), "ATLAS der Schreibmaschinenschrift, PICA". ^ Haas, Josef and Bernhard Haas. (1985), "ATLAS der Schreibmaschinenschrift, Non-PICA". ^ Bouffard, P.D. (1992), A PC-Based Typewriter Typestyle Classification System Standard, presented at the American Academy of Forensic Sciences meeting, New Orleans, LA. ^ Hodgins, Cpl. J.H. (January 1963). "A Punchcard System for Identification of Typescript". Journal of Forensic Science. 8 (1): 68–81. ^ ASTM International Archived 2006-03-31 at WebCite, These guides are under the jurisdiction of ASTM Committee E30 on Forensic Sciences and the direct responsibility of Subcommittee E30.02 on Questioned Documents. Copies of ASTM Standards can be obtained directly from ASTM International. ^ a b c d Betea, Lavinia (February 13, 2009). "La Miliţie cu maşina de scris" (in Romanian). jurnalul.ro. Archived from the original on September 4, 2015. Retrieved August 24, 2014. US349026 – typewriter ribbon, by George K. Anderson of Memphis, Tennessee. Adler, M.H. (1973). The Writing Machine: A History of the Typewriter. Allen and Unwin. Beeching, Wilfred A. (1974). Century of the Typewriter. St. Martin's Press. pp. 276 Beeching was the Director of the British Typewriter Museum. Look up typewriter in Wiktionary, the free dictionary. Wikimedia Commons has media related to Typewriter. The Eclectisaurus online Museum of Typewriters by manufacturers from Adler to Voss. Robert, Paul (2001). "The Virtual Typewriter Museum". This page was last edited on 7 April 2019, at 13:56 (UTC).